Welcome to the California Division of Boating and Waterways (DBW) safety and education page! DBW relies on partnerships with many organizations (educational institutions, aquatic centers, the U.S. Coast Guard Auxiliary and the U.S. Power Squadrons) and more to provide boating safety education and positive outreach to children, youth, and adults. If you are a first-time boater or if you just want to learn the latest "rules of the road", this page will help make your boating activities safe and enjoyable. This DBW course meets the new California Boater Card education requirement. It can be read online or downloaded to a home computer. The exam consists of 60 questions. Students who use the online book may order individual exam packets. This national and state approved course allows boaters to study at home at their own pace, and it covers state and federal boating laws, rules of the road, boat handling, required equipment, navigational aids, accident reporting and special topics. Once completed, the answer sheet can be returned to DBW for scoring. Certificates of completion will be mailed to students who receive at least 80%. (Please allow four to six weeks for delivery). Click here to open the digital course book. If you are interested in taking the exam, after reading the digital course book, e-mail DBW to request an exam packet be delivered by mail. Books/exam packets cannot be delivered via fax or e-mail. The good news: Boaters can prevent most accidents by learning safe boating techniques and using common sense. 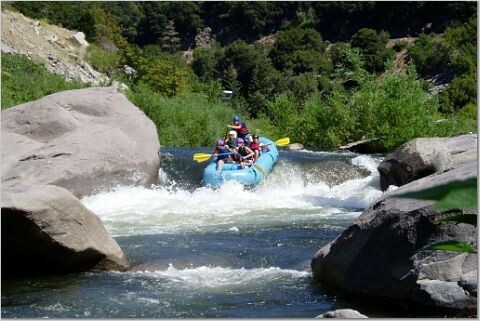 California boating safety courses are designed to provide boaters with state specific boating laws and federal navigation requirements in many different environments to suit individual boater needs. There are home study, classroom, online and on-the-water courses. The new California Boater Card requirements can be found in the links below. The courses shown on this page are approved for the California Boater Card. If you are looking for another course to fulfill the card requirements, be sure to check that it is on the list of approved courses. If you are looking for more advanced courses, check out the many providers and aquatic centers throughout the state. Parents and teachers can give their children and students a head start on boating and water safety through the K-12 AquaSmart safety curriculum. Aquatic centers are operated by universities, colleges, local public agencies, and non-profit organizations, provide classroom and on-the-water boating safety education in kayaking, canoeing, water skiing, powerboating, sailing, personal watercraft operation and other aquatic activities. Some centers specialize in programs for the disabled. Minimal cost. Please contact individual aquatic centers for details. Contact individual aquatic centers for details. 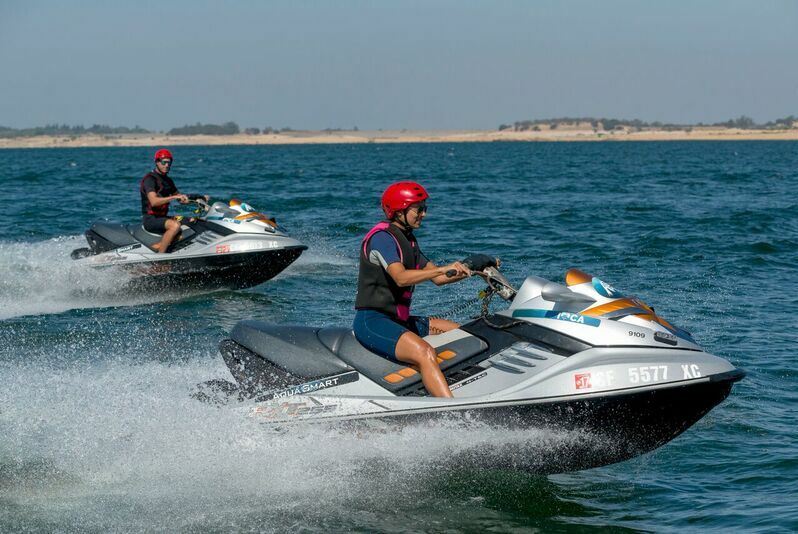 Wave Runners, Jet Skis, Sea Doos, Tigersharks---personal watercraft or PWCs, go by many names, and they all mean fun. They are found at most waterways these days. In 2015, there were nearly 100,000 PWCs registered in California! Personal watercraft are fast, powerful, and fairly easy to operate, but they are also involved in many boating accidents and injuries. With their ever-increasing popularity it is important for all PWC users to know how to operate them safely and with courtesy at all times. California boating accident statistics paint a picture of PWC use and misuse. For example, PWC account for 13% of registered vessels, but 17% of all reported boating accidents in 2015 involved PWCs. Of those PWC accidents, the majority (59%) involved a collision with another vessel or fixed object. There are three main causes of PWC accidents: inexperience, operating at excessive speed, and inattention on the part of the operator. Finally, there are two statistics that show a real need for public education on the proper, safe and fun use of PWC; over half of PWC accidents (57%) involved people who had borrowed a vessel and another 37% had rented their equipment. These accidents might not have occurred if the operators had taken the time to read the owner's manual and safety literature that most dealers provide after a sale, or taken a safe boating course. 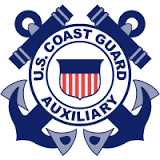 The US Coast Guard Auxiliary offers a variety of public educational classes including Boating Skills and Seamanship for powerboats and Sailing and Seamanship for sailors. Both classes generally last 13 weeks and cover legal requirements, rules of the road, aids to navigation marlinspike seamanship, charts and compasses and boat handling. Some auxiliary flotillas also offer classes in basic coastal navigation, boating safely, advanced coastal piloting, advanced coastal navigation, personal watercraft, sailing fundamentals, boat and kids, and water and kids. Minimal cost. Please contact the United States Coast Guard for details. 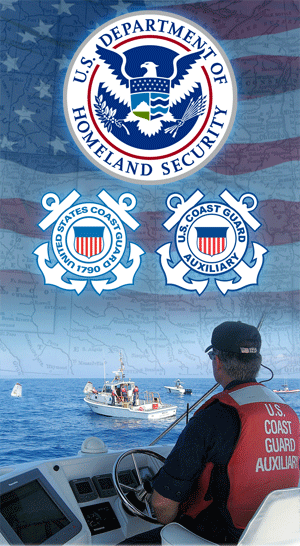 or visit the US Coast Guard Auxiliary's website. The US Power Squadrons offers basic boating knowledge education through participation in classroom or online presentations of America’s Boating Course (ABC). Classroom and online course content is the same. The student may choose either the English or the Spanish version. Classroom presentations are offered by the 16 US Power Squadrons located in California. 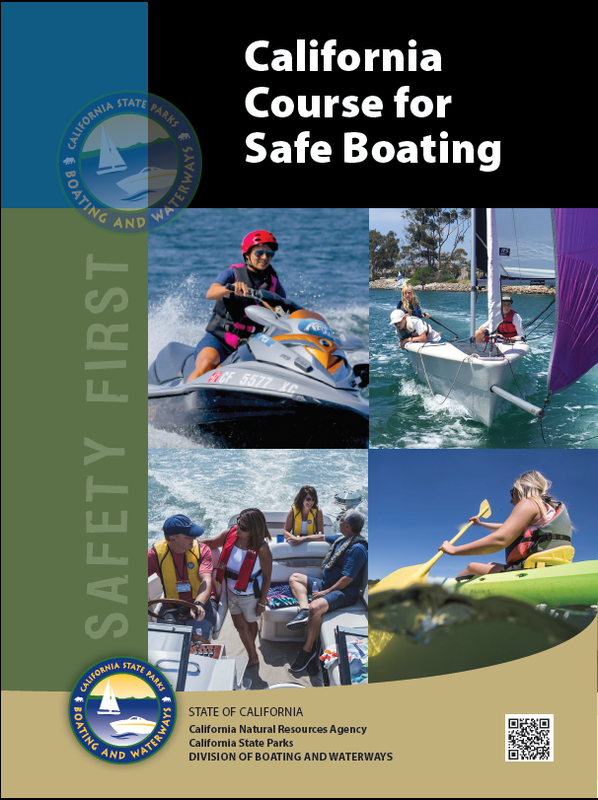 Course content is in 16 sections: About Boats; Required Safety Equipment; Going Boating; Navigation Rules; Navigation Aids; Lights and Sounds; Government Regulations; California Regulations; Finding Your Way; Anchoring; Adverse Conditions and Emergencies; Communications Afloat; Water Safety Sports; Trailering; PWC Operations; and Knots and Lines. The course may be taken online or in a classroom setting. When enrolling in the online course students choose either the English or the Spanish version, then receive a Personal Identification Number (PIN) which allows access to the online e-book, course content, quizzes and final examination. 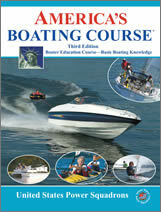 The classroom course includes a hard copy America’s Boating Course student manual. The classroom presentations are scheduled by the US Power squadrons with notation on which language they are presenting. Course registration may be online or for classroom presentation direct to the local squadron. Successful completion of either course meets the required education for application to obtain the California Boater Card (CBC). Minimal course fees are included with the postings about the course schedules.